Create a feature in the garden with a Pedestal to raise pots, statues and water bowls to viewing height. Add some Columns to each side of a garden path to create an arbour or focal point. These tow simple additions to the garden can make a big impact. If you are looking to add a little height in the landscape, garden pedestals and garden columns can do this in different ways. 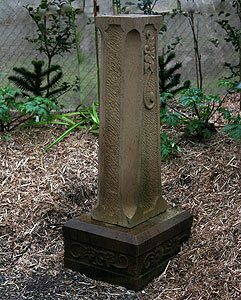 Pedestals are widely used to support garden sculptures at close to eye levels. Plants in containers can also be placed on a pedestal for better viewing or just to create some extra height in the garden. Garden columns in concrete, cast stone and metal are all useful as ornamental supports for arches and arbors. 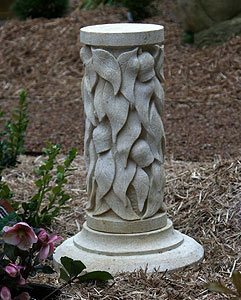 You can buy a variety of styles, even find columns that that look as though they are straight from a roman ruin, and they can look great in the garden. Weather resistant is almost essential. The right style for the garden design. The right height for the purpose. A broad to enough to support a statue, potted plant, bust or other ornament. Maybe lightweight is required in some circumstances. Remember that plants growing over columns will add weight as they grow. A firm base is essential, so a small concrete block firmly set into the ground is a simple solution for a pedestal, for larger columns you may need a more permanent method of installation to ensure safety. To add height in the garden border. As a place for low growing of trailing plants that you wish to display in a more prominent position. For temporary display of flowering plants in season. Use them as a focal point an the end or on bend in a pathway. Either side of a pathway to mark a transition point to a new part of a garden. Australia's first 'Made to Order' retailer of Fountains, Columns, Pedestals, Pots & Urns, Birdbaths, Buddha's, Angels, Fairies, Religious, plus many more. Visit our Garden Showroom.